There's no doubt that God hears us when we pray. 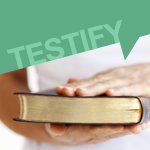 Here are some testimonies of His answers! "I am from Gambia, West Africa. Years ago the Lord led me to The Believer's Authority by Kenneth E. Hagin. I have now read MORE THAN 50 BOOKS by him. These books have prepared me to lay hold of successes and overcome deadly challenges. I have many testimonies to give because of these books, but here is one. "Thank you for all the material you put up every day on healing. It has been a great source of God's Word to hide in our hearts." Tell us what God has done for you! We'd love to hear your testimony. Share it on Facebook or email us.